You! Yes, you. It’s a Friday evening and you’re not outdoors clubbing or romancing. Yes, I know I’m not either, but I’m part of the homogeneous collective known as the gaming press: we do not do things like leaving the house. If you’re here, then you may as well be filling your time with the same methods as I: Skrillex Quest. It’s free, it’s fun, and it’s stylish. Developed by Jason Oda, Skrillex Quest drops you into an old NEScartridge world suffering from the deadliest of dangers: dust on the teeth. 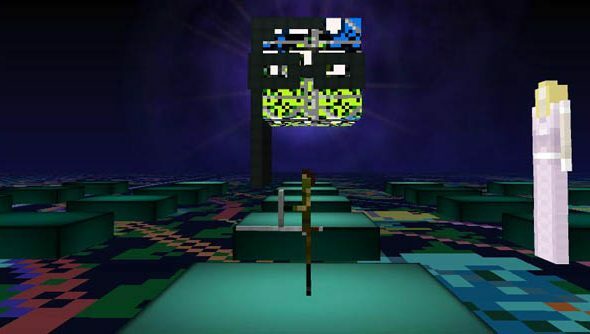 As the king’s great warrior you’re sent on a quest to dislodge the dust, fighting your way past corrupted data files and finding keys to unlock the princess’ ghost from her imprisonment (yeah, the story doesn’t make a great deal of sense), you move through a slowly degrading and collapsing virtual world. The clearest influence is the original Zelda game, there’s even a dungeon sequence that could be lifted straight from the first temple. Though the character design owes something to the long-legged, thin-pixelled protagonist in Sword & Sworcery. Of course, the entire thing is set to the score of Skrillex, y’know, because of reasons. It’s free, go and try it out.